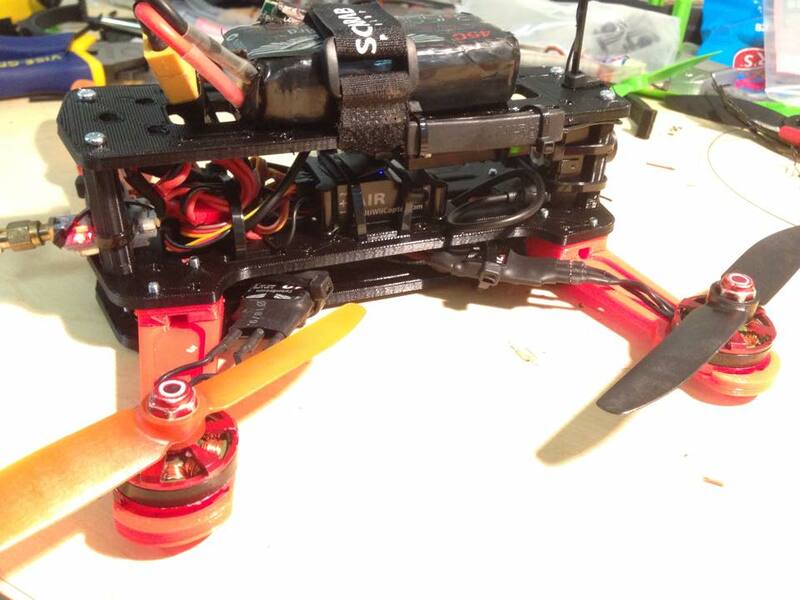 Here’s the assembled mini quad! Don’t ask why there is a random surfboard there. It was just there in the park. Turns out it makes a pretty good landing pad! The 3D printed parts went together very nicely. The only bit I struggled with was the standoffs. They were supposed to be big enough to fit an M3 nut in the ends, but weren’t. In fact, the threading was so tight it was very hard to get the bolts in at all, which is why I’ve only fitted 4 of the 8 standoffs! Right now it’s running 5″ props which feel a little underpowered, but I was able to get about 6 minutes of buzzing up and down my driveway. 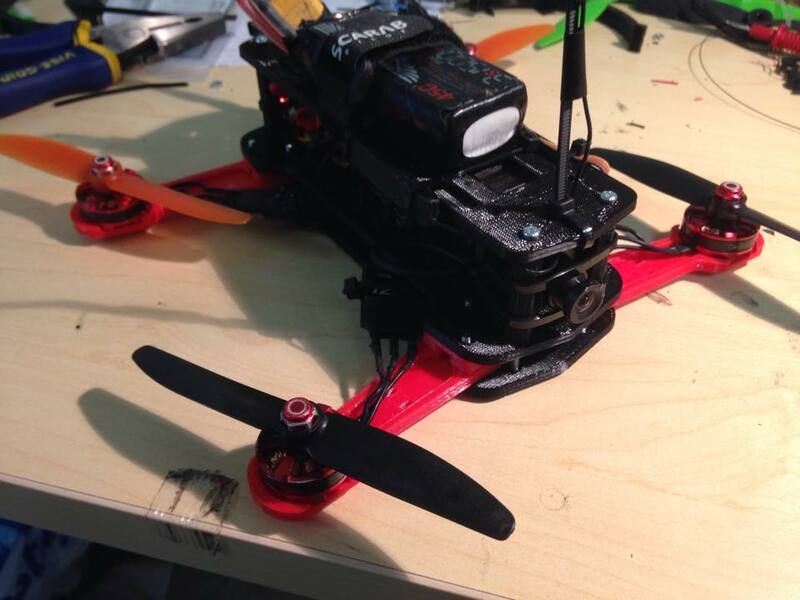 I’ll definitely be changing the design to accommodate 6″ props. It flies quite nicely, no oscillations or vibrations running the same PIDs as my Scarab Knife, which I found interesting! It does feel different to the Knife when you roll into a turn – it feels a bit ‘top heavy’ – I’m not sure if this is just the PIDs that need tuning, or because the battery is sitting up high, and the electronics sit above the motors. I’ll be taking it out for a proper workout tomorrow, but so far I’m quite pleased! Replace crappy Philips-head bolts with proper hex bolts. Make a ‘battery holder’ to stop the battery sliding forwards or backwards. Make a proper mount for the FPV transmitter. Right now it’s just held loosely on with some zip ties. Make a proper mount for the FPV camera, it’s zip tied to the front standoffs, but it makes it hard to get it pointing perfectly straight. Remove a lot of excess cabling – I am re-using parts from other models, so I don’t want to trim anything yet. 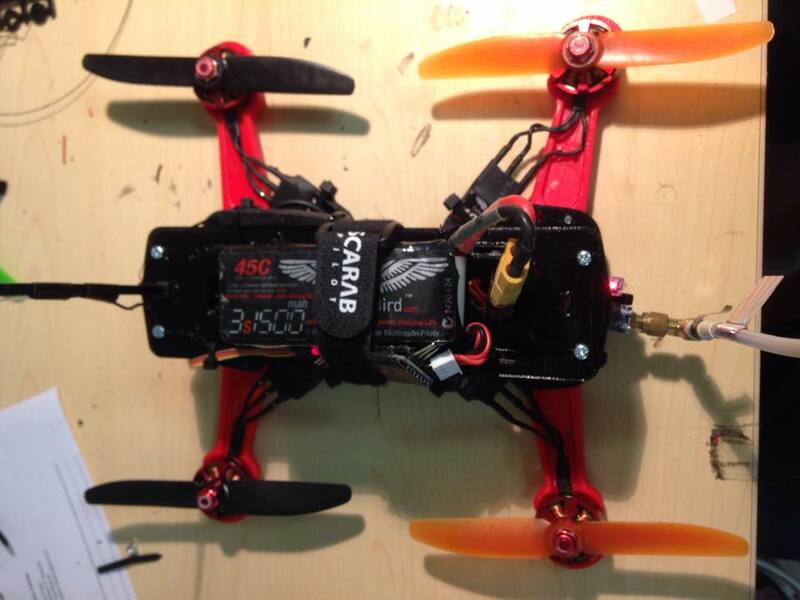 Possibly change the ESCs for ones without bullet connectors to reduce their size. Plenty to keep me busy!